Let your child create an amazing selection of tasty snacks with the LEGO® DUPLO® Creative Picnic set! 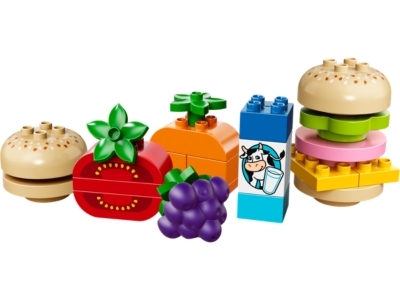 They’ll love combining the colorful bread, meat, ketchup, lettuce and various other bricks to serve up the tastiest sandwiches, burgers and snacks ever – served with a carton of DUPLO milk of course! The box lid also doubles as a serving tray and sandwich recipes are included with the set to get you and your child started! Last known price is 52% below the initial Lego retail price! The Creative Picnic (10566) Lego set is no longer directly available from the sites below. However, 3rd party partners of these sites might still have the set available. Alternate description Enjoy a LEGO® DUPLO® Creative Picnic with sandwich elements and fruit until your child has built the ultimate tasty snack! Enjoy seeing who can make the biggest sandwich!